A seventh successive home win took Cardiff City back to the top of the Championship table. 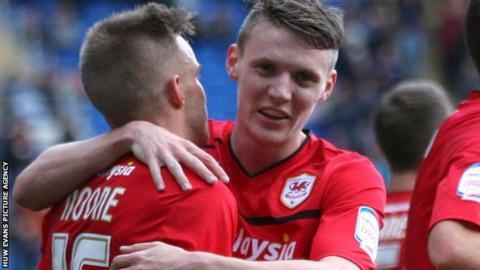 The Bluebirds were rarely ruffled once Joe Mason scored from close range on three minutes after Craig Noone's shot fell into his path off the far post. Noone doubled the advantage with a drilled effort from 25 yards before being denied a second by the crossbar. Matthew Connolly's header and Aron Gunnarsson's side-foot finish completed Cardiff's biggest win of the season. The final goals came within three minutes of each other inside the last 10 minutes and meant the scoreline gave a fairer reflection of the home side's dominance. Peter Whittingham, whose cross was converted by an unmarked Connolly, was again influential in midfield, while Kim Bo-Kyung impressed on his first start of the season. But Noone will take all the plaudits, rightly given a standing ovation by the appreciative home crowd when substituted moments before Cardiff's third goal. On a clear but bitterly cold day in the Welsh capital, Cardiff immediately warmed to their task against managerless Burnley. Mason, benefiting from injuries to Craig Bellamy and Tommy Smith to make only his third start of the season, showed no sign of either rustiness or over-enthusiasm as he kept calm to convert his first opportunity. When Noone's curling left-foot shot crashed against the far post, striker Mason resisted the temptation to shoot first time and took a touch before lifting the ball over goalkeeper Lee Grant. The post then denied Mason a second, but his movement throughout was too slick for the static Burnley defence. Cardiff's pressure delivered a second goal minutes before the break when Noone was given too much space in front of goal. The winger's driven 25-yard effort moved slightly in the air, and Grant could only palm the ball into his own net. Apart from a brief period at the start of the second half, Burnley offered little to trouble the Cardiff defence, denying Charlie Austin the opportunity to break a club record by scoring in nine successive games. The visitors could not match Cardiff's superior work-rate and movement, and were fortunate not to concede a third when defender Ben Turner headed wide. Noone, a constant threat down the right flank, was then denied a second when his curling shot rebounded off the crossbar to safety. But Cardiff's probing finally paid dividends in the closing stages as right-back Connolly was left unmarked to head in Whittingham's cross, before Rudy Gestede's cushion header gave substitute Gunnarsson a simple task to score the fourth. "We've played against the top scorers in the league and top scorer in Charlie Austin so to keep a clean sheet, take our chances and be clinical at the other end, I'm very pleased. "The goals were excellent, but we could have had more. I'm delighted that the hard work and good play was finished off well with the goals as well. "We kept going even at half-time at 2-0 up. We combated them well, played in between the lines and put them to the sword in the second half." "The goals we conceded were self-inflicted. After the first goal we never really recovered. "We tried to be positive in the second half to try to get the next goal, but we conceded a third. "It was poor decisions in open play and we got punished. But we all have to be accountable. Cardiff are top of the league and it's no fluke - they are playing consistent football. It was a tough afternoon for us."